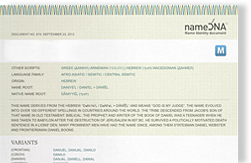 This name derives from the Biblical Hebrew name “kâlêb > Kalev”, meaning “dog”. A reference to him may also be found in the Quran, although his name is not mentioned. An alternate Hebrew meaning offered for "Caleb" is "faithful, devotion, wholehearted, bold, brave one". 1) Kalev was the godly son of Jephunneh and the faithful spy who reported the Promised Land favourably and urged its capture. 2) Kalev was also son of Hezron and grandson of Pharez and great grandson of Judah and the father of Hur and grandfather of Kalev the spy.